Rental space situated close to many transport points and shopping arcade near to the I-465. This facility offers the majority of space as Virtual Office space with a limited serviced space, therefore allowing an easy move between the two types of facilities offered. Space to rent at the Precendent Centre, close to the I-465 and 96th Street and to the Keystone Crossing Fashion Mall. 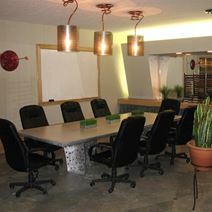 This centre offers the professional easy access to the many restaurants, cafés, and bars in the area. The tower offers meeting rooms that can accommodate many persons easily and includes fully furnished office suites that can be tailored in terms of size anywhere from up to 3,000 square feet. The facility also includes a gym and is situated on beautiful surrounding, making this an ideal business facility. Within walking distance of Indianapolis Metropolitan Airport this high quality business center is within a Class A office building at the "Crossroads of America". The great local transport links make the area particularly popular with aviation services companies and publishing houses. The area also offers excellent transport networks, with convenient and frequent road and rail services in operation throughout the locality. This centre is located in an ideal location close to the I-31 and I-465 offering easy access to the airport and surrounding towns, making this Parkwood location an ideal centre. The offices are modern and located in this 5 story building offer lots of cafés, restaurants and other amenities nearby. This center located close to the I465 and the 431 Highway where the exit to get off the Keystone Avenue. This facility provides easy access to Downtown and to the Airport. There are plenty of hotel accommodation facilities with places like the Sheraton North, and nearby prestigious retail stores and many restaurants. This facility offers a modern design with furnished office suites, and an on-site fitness center and eateries. Less than a mile from the Amtrak station this technologically sophisticated and premium standard business center on Massachusetts Avenue provides a wonderful mix of private and co-working office space, meeting rooms, common spaces and private phone rooms. Local coffee is served to members daily while the building is topped with a rooftop deck for you to make the most of the sunshine away from your desk. Located in the heart of Monument Circle, Downtown Indianapolis overlooking the Soldiers and Sailors Monument this historic tower building provides one of the city"s most prestigious addresses. Tenants have a choice of state-of-the-art co-working or private suites while perks include company logo display, an array of networking events and a fully-stocked kitchen with espresso bar and local beer on tap to name just a few. This center occupies the third floor of a building in the heart of Indianapoliss historic district. With excellent accessibility, these workspaces are well-equipped and ready for your business. The area is home to a highly skilled workforce, and is highly accessible by public and private transport. The center is easily accessible from afar due to the excellent range of transport links available throughout the locality. Serviced office space is being offered at this exclusive building in the centre of this downtown busy West Side location with nearby shopping amenities at the Circle Centre Mall. These offices are modern and are offered fully furnished and come with the latest in internet access, conference room, a break out area, and a friendly team to provide support when needed. This facility can be accessed 24 hrs. This business centre is located in the new One River Crossing minutes’ away from the I-465 based on the North side. This facility is near to many restaurants, shops, bars, and hotels, and also provides easy access to the Int. Airport. The offices offer state of the art network and telephony services along with videoconferencing and catering facilities. Leased space is now available close to the Circle Central shopping mall offering a range of services and amenities. The building is well built and offers well appointed offices with grand furnishings and entrance lobby. This area also offers an onsite bistro, easy and covered parking, fitness centre and safe and secure 24 hr access.